Sedona is hands down the most beautiful place I have ever seen in America. I had been hearing about the good energy radiating from this place for some time. I read about the Vortex’s, great hikes and amazing views. I even had a first hand account from a native of the area, Miss Molly Sue! Everything told me that I had to go. So my brother, and two of our friends packed up to head out west for the week. 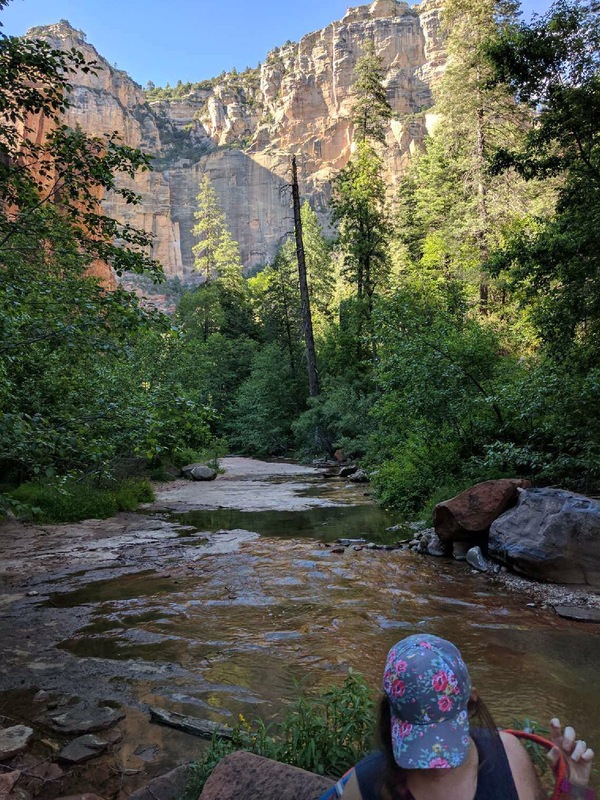 We made a week out of a bunch of quick stops: Phoenix, Sedona, Grand Canyon, Mount Zion National Park and Las Vegas. We had a lot to see in a relativity short amount of time. Here I am just going to Highlight, my three favorite places to go. But first I would like to give a shout out to Sky Ranch Lodge for being the best place to stay in all of Sedona. You are set up in the rocks with the most epic views. There is a pool, a hot tub, a viewing deck great for sunrise and sunset. They serve beer and wine on a cute little patio, The rooms are spacious and simple and you can walk to another observation deck and the Airport Mesa Trail. This is one of the views right outside my hotel door. People would gather here for sunset and tour buses would stop frequently for photo ops. Luckily for patrons of the hotel, there is a private viewing deck on the back side. 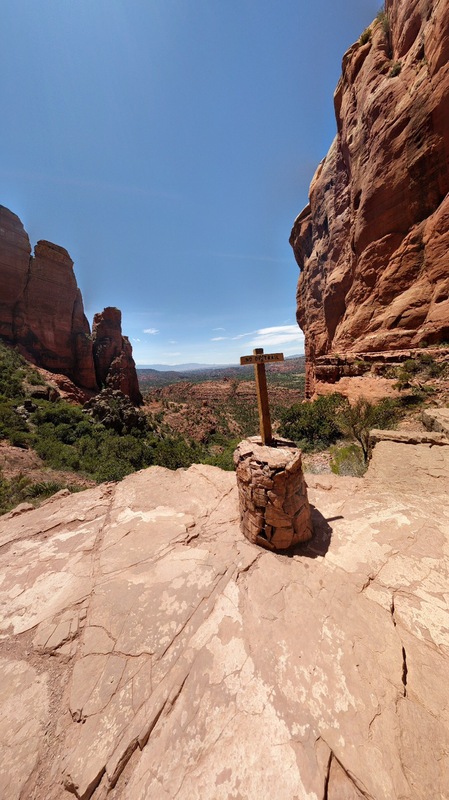 My top three favorite spots are Cathedral rock, Amitabha Stupa and Peace Park, and West Fork Trail in Oak Creek Canyon. This is a tough trail. If people are telling you it’s not, they are lying. Coming from someone deathly afraid of heights, it’s scary. It is a strenuous, vertical climb. There is a part where you wedge yourself between two rocks to get up. You will need to use both hands and both feet. My advice is to not look back…. or down in till your headed that way. The view will literally take your breathe away. If you are like me, it will also paralyze you temporarily. This place is so magical. 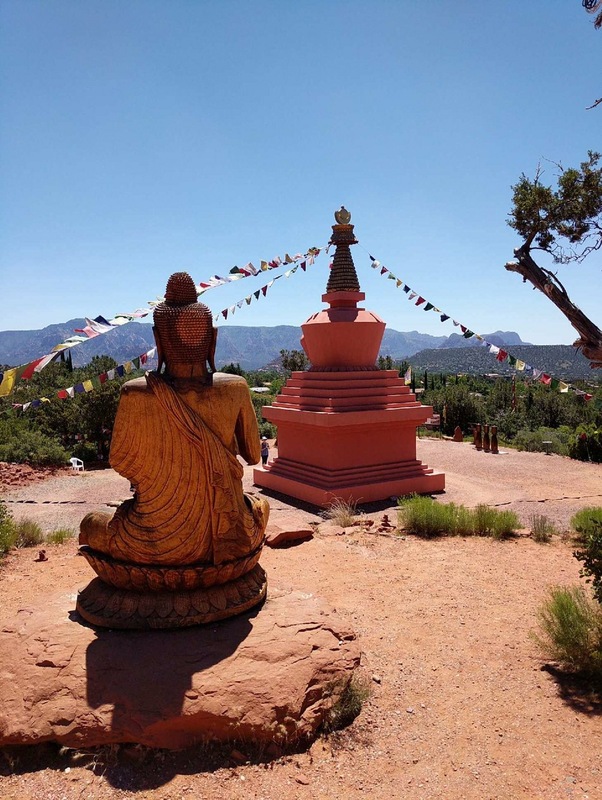 A stupa is a structure created by Buddhist to store relic and create a place for meditation. They are meant to bring blessings and promote prosperity. You can literally feel its power walking into the park. There are bells and wind chimes scattered through the trees. 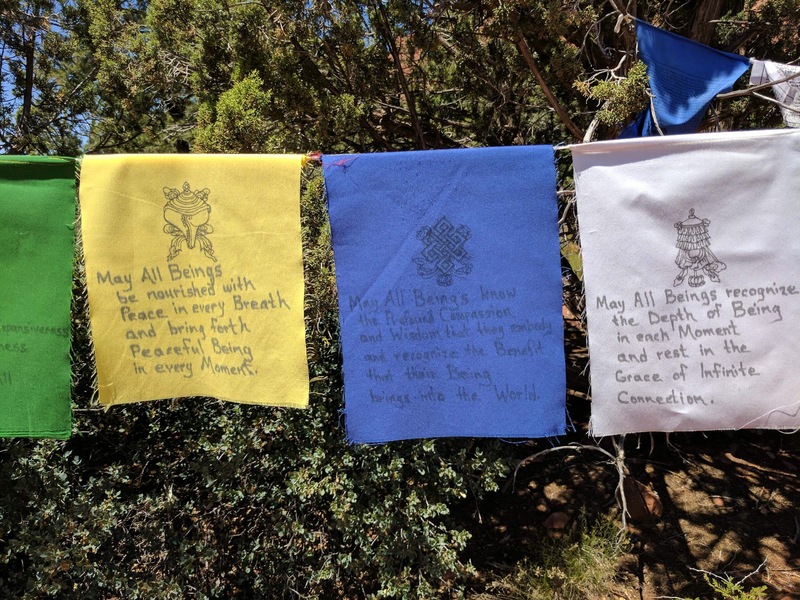 Prayer flags are left behind in strands of color with messages for strength, love,peace and blessings. Everywhere little trinkets are left behind as offerings: little Buddha statues, crane origami, stones with written messages, and a pile of hair ties stacked on a stone. We were luckily enough to arrive while a couple of monks were in practice, circling the smaller Stupa. It makes the beauty of the place seem more sacred. The air is constantly filled with a light breeze. An older lady meditates in a chair at the top of the bluff, hidden in the shade. Everyone walks slowly, everyone feels solemn and wonderful. No one talks above a whisper. A few people sit in silence and awe at the alter. A couple stops to admire the large wooden carved Buddha at the top of the hill. I wished to start every day feeling this amazing, this centered. I wondered how such a place creates so much reflection and stillness. How is it that, it can be felt by every single person who’s been there regardless of spirituality and religious beliefs. I put this super high on the list of my favorite destinations to experience ever. I highly recommend it for anyone going through a healing process, searching for serenity or needing a clear mind and cleanse for a fresh start. West Fork is the most enjoyable trail we took. This is an in and out trail about 3 miles each way. I would recommend bringing a lunch and stopping anywhere along the way that pleases you. There are great views everywhere and tons of nice little areas off the path to stop. We had eaten before we left. Still we stopped what seemed like 100 times to enjoy different scenery. Here are max and Cortney enjoying a couple of the stellar spots. The trail is relativity flat and easy. Majority of it is in the shade, with the canyon and trees towering in the sky above you. If you stay on the path you cross the water over stone 13 times, if I remember correctly. However, I would recommend wearing water proof shoes and opting to skip some of the trail line and walk through the creek instead. We went on the most amazing day and the water was crisp and refreshing. I bought these Keen Evo all terrain shoes just for this trip. They are like walking on air and went from water to trail with ease. I have all together traded in my old hiking shoes for these, even when water won’t be involved. The first thing we wanted to see was a big old “traditional looking” Cactus, which I have come to learn is called the Saguaro Cactus. You won’t see much of them in Sedona. We drove in from Phoenix and on the ride in, saw what seemed like one million. All we wanted was a picture with one. Don’t make our mistake, stop for one before you get to Sedona. They have plenty of other cactus though, so don’t worry. Like this one below. 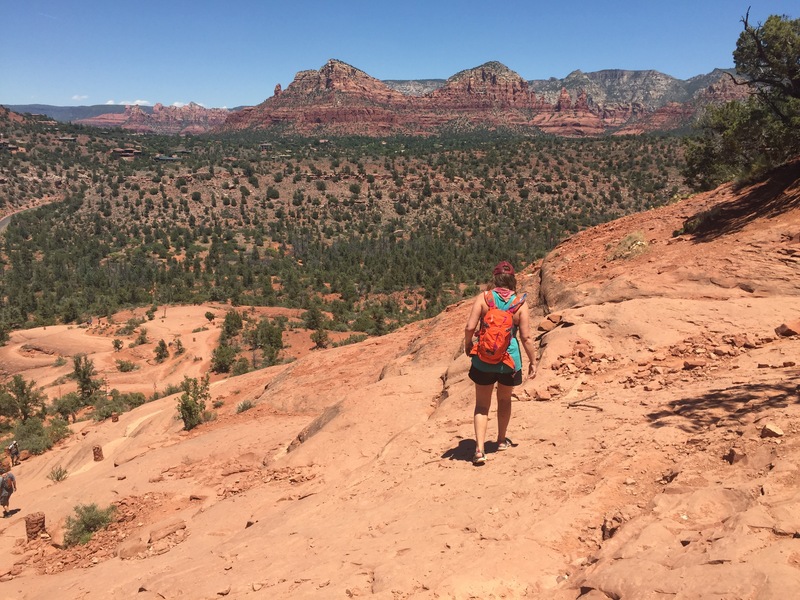 Sedona is way more green than you think, also a home to the Pondarosa Pine. There is a usual $10.00 parking fee at the parks. You can pay with card at most with the automotive machines. Out of this list, only the Stupa is free. We had a tour guide say he found it appalling that tax payers have to pay an additional fee to enjoy something we already pay for. 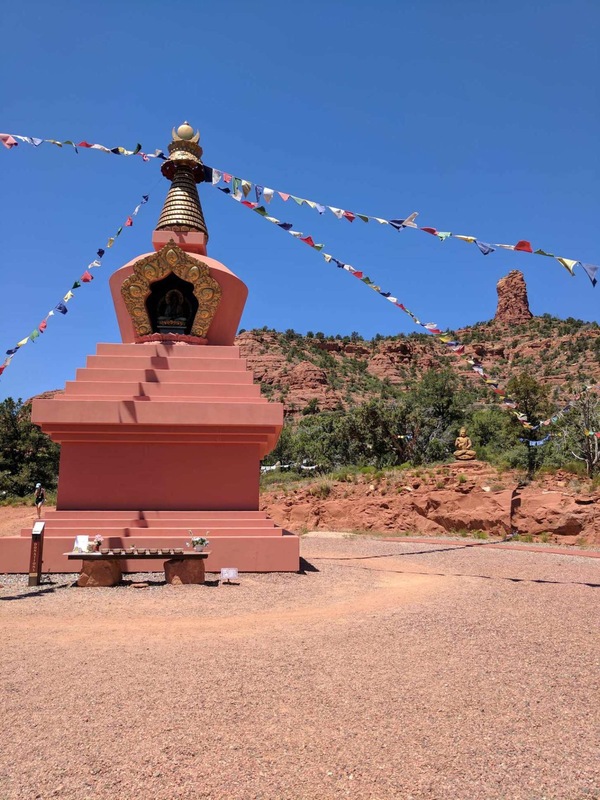 He explained why Sedona is different in this regard but in my opinion 10 dollars is ok to see such wonderful things and help run and maintain the parks. I recommend the Pink Jeep Tours even though they seem cliché. If you are pressed for time, I always opt for a tour. They are great ways to see more with less hassel. We took the Grand Canyon Premier Tour, which was amazing. You can see my pictures and summary of our tour here. These were my three favorites while in Sedona. Indian Gardens – Café, beer store, gift and coffee shop all in one. It’s a great stop if your heading to the Canyon. Right off 89 it’s a great fuel up lunch spot off 89. The Coffee Pot – Home of 101 omelets. The atmosphere is very Sedona Western. We felt like we were in a western movie. The coffee was served in this awesome mug, which you can purchase in the gift shop after if you like. Elote Café – Hands down, the best Mexican restaurant! It’s on the second story above a hotel lobby but don’t let the location fool you. The food is to die for!! We had the special Fundito, that came with Bacon, sweet corn and Jalapeno. The guy at the table next to us summed it up best when he said, “There’ a party in my mouth, its so good!” Cort and I shared the signature Elote and the Carnitas. We left feeling so full and so happy. This is a can’t miss spot for me. 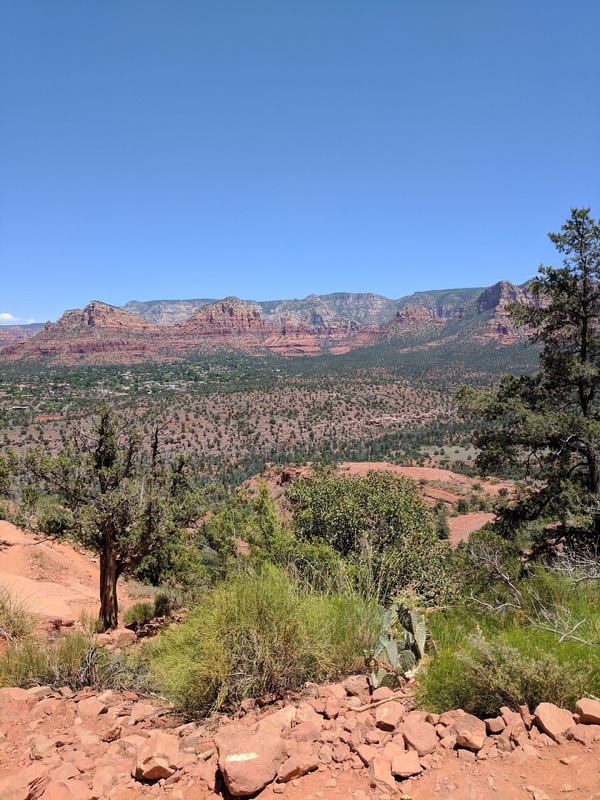 I thoroughly enjoyed my time in Sedona, as short as it was. I plan to go back whenever I get around to it, please leave comments about your time in Sedona. Maybe there is something I definitely need to see that you already have!! I feel like I belong in the desert now, and somehow all the powers in this magical place have turned me into a desert queen. Keep seeking Stories, Styles and Adventures. If you’ve enjoyed this post, you can subscribe to see more like it on the left. or jump to see the next part of this adventure, Grand Canyon Excursion. Previous This was a post about Nashville, now it is about friendship. Awesome review. You make me want to pack up the car & head out west! You can throw me in the car too, and I’ll head back with you! I told you you would love it. It’s beautiful out west.